Now that's a big one - the handset with one of the longest spec sheets we've ever seen has just dropped on us like a bomb. 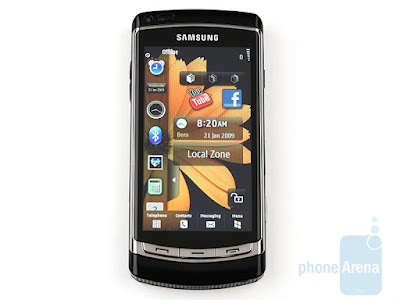 The Omnia HD is Samsung's go at touch-taming the Symbian S60 and is introducing truly revolutionary stuff. A 3.7" OLED capacitive touchscreen, an 8 megapixel camera that should be able to humble even some digicams and of course the HD video recording - does it really get any sweeter? Geeks have been warned - continue reading this preview at your own risk. We are not to be held responsible for sleep disorders or compulsive spending. Samsung i8910 Omnia HD is surely one of the most interesting packages to look out for at this year's Mobile World Congress in Barcelona. With a specs sheet like that it's hardly a surprise but we cannot quite get Samsung's choice of name. There was nothing wrong with the original Omnia but reusing a name is not exactly suggestive of revolutionary. Oh, and don't get us started on the superscript. It may look cool and all, but just go ahead and google OmniaHD. With the following preview we did our best to provide you with as much information as possible for the very short time we spent with the handset. Since our unit is at the very early stages of development we would focus mainly on the hardware and ergonomics as the software is well in need of getting polished. By the way, we've already reviewed the Symbian S60 5th edition touch user interface with Nokia 5800 XpressMusic, so you should already know the basics.